Spa-style bathrooms have become increasingly popular in recent years as homeowners seek ways to improve the comfort and performance of their own homes. For this reason, many homeowners choose to add features to their bathrooms that make them feel like a luxury retreat. Two of these include steam and jetted showers. Both help you relax at the end of a long day, but each is different in how they work and the experience they provide. We’ll outline the differences below so that you can make a more informed decision for your bathroom. Typically, a steam unit is installed behind the walls and hooked up to the plumbing. An electric unit, which controls the temperature and output of the steam, is mounted either inside the shower or just outside. A small nozzle, usually located near the bottom of the shower, provides the steam. To use the shower, close the door, set the temperature and duration, and relax on a seat or bench. Jetted showers, also called performance showers, are more invigorating and shorter experiences. The shower head or heads are accompanied by body sprays, which aim pressurized water at different points of your body — upper and lower back and legs. In a jetted shower, the controls can include a thermostatic valve that allows you to pinpoint the exact temperature of the water, and volume control valves to turn on the shower head and body sprays separately so that you can customize your shower. The body sprays must be installed in a vertical row. Also, all must be turned on to provide the necessary pressure. Steam showers are fairly easy to install, even to retrofit to an older shower. The steam unit is installed behind the walls, with a separate pipe supplying the water. The steam is then pumped from the unit to the shower, where it emerges from a small, discreet nozzle. An electrician is necessary to connect the panel that controls the unit. Jetted showers are more difficult to install because they have more components. If you want good water pressure, then it’s recommended that the bathroom be plumbed with ¾-inch pipes and shower valves. However, if your pressure isn’t good, then ½-inch pipes are recommended to boost the pressure. The thermostatic valve is installed, and this is where all the pipes entering the shower meet to control the temperature. From this point, they split off. One goes to each shower head, while each row of jets has its own supply and volume control valve. The body sprays are installed in what is called a “pressure balancing loop.” This means that they are all connected to one another so that each has equal pressure when the volume is turned on. No electrician is necessary for the installation, but it will take the plumber significantly longer to install the pipes. The steam unit itself costs between $600 and $1,000, depending on the size. This is calculated by taking the cubic feet of the space — height x width x depth — and multiplying that number by two for each outside or glass wall. A larger shower and more outside walls means a larger unit will be needed. Installing the unit costs between $45 and $65 an hour for a plumber for at least four hours and $65 and $85 an hour for an electrician for one to two hours. The total cost for an installed 5-foot square shower is approximately $1,430. If your shower does not already have doors that reach the ceiling, add another $2,000 for a total of $3,430. The same size jetted shower with 2 shower heads, 3 body sprays, 2 volume control valves, and 1 thermostatic valve would cost around $2,000. Installation takes about 8 to 10 hours at the cost of $45 to $65 an hour for the plumber, for a total of $2,650. Steam showers use relatively little water because any water that enters the unit is converted into steam, which takes up more space as vapor than as a liquid. The unit also heats the water to steam, which means that it uses much less electricity than a water heater, which supplies a jetted shower. For this reason, people who have wells or small hot water tanks can still enjoy a spa-style shower. Jetted showers use a tremendous amount of water per minute. A body spray uses between 2 and 5 gallons of water per minute, and most jetted showers have at least three. A shower head in a jetted shower uses roughly 7 gallons a minute, and most showers have two. This means that on average, a jetted shower uses 23 gallons of water a minute, which is more than the average output of some wells. In addition, if your home has a standard hot water heater of 25 gallons, a jetted shower will only give you a 1-minute shower before the hot water runs out. Upgrade to a minimum of a 100-gallon heater to ensure a 5-minute shower. Steam showers are meant for sitting and relaxing. Many people follow their steam with a cool shower from a standard shower to finish the cleansing and relaxing process. 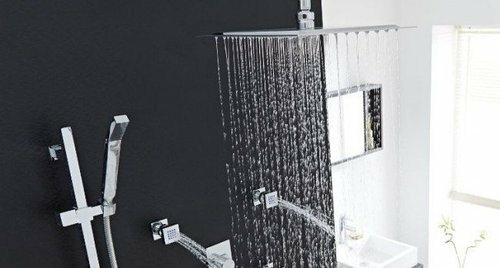 Jetted showers use significantly more water than standard showers or steam, so they are meant to be enjoyed more quickly. The average jetted shower lasts between 4 and 5 minutes, giving you a quick massage rather than a long, relaxing experience. The material for your shower varies depending on the shower type. Steam is essentially water vapor, which is very small water particles, so it can enter porous surfaces and deposit minerals that may be in the water. For this reason, natural stone cannot be used in a steam shower because this may stain the stone. Other porous materials may cause mold or mildew growth if not kept well sealed, including the grout joints in tile. Jetted showers can be installed with any shower surround. Steam showers are designed for 10 to 20 minutes of use. This may lead to some health problems. After 10 minutes, the heart rate can speed up to double what it was before entering the shower. After 15 minutes, there is also a risk of dehydration, so it is recommended that users drink two glasses of water beforehand. Some chronic illnesses, including asthma and skin conditions, may worsen in a steam shower. On the contrary, jetted showers have no such health concerns and can be enjoyed by a wider group of people. How much does it cost to install a steam or a jetted shower in my city? Cost to install a steam or a jetted shower varies greatly by region (and even by zip code). To get free estimates from local contractors, please indicate yours.